Prospa’s impressive growth trajectory is set to receive a boost when it becomes Australia’s first online small business lender to list on the ASX. But the prospectus exposes issues of transparency for the acknowledged market leader in what is a largely unregulated market. Propsa will raise $146m of new capital of which $100m will fund the growth of its loan book and investment in new products and markets while $46m will enable existing shareholders and management to take some money off the table. Since its establishment in 2012, Propsa has lent over $500m to Australian SMEs and has a current net loan book of $200m. It has won or placed highly in many awards including Deloitte TechFast 50, Telstra Business Awards, KPMG Fintech 100 and AFR Fast Starters. Prospa doesn’t really compete head-on with the banks but rather its niche is those SMEs that need relatively small amounts of money in a hurry. It’s average loan size is $26,000 and 98 per cent of loans are for less than $100,000. The average term is 11.7 months and 94 per cent of loans are for 12 months or less. Perhaps the main reason SMEs seek funding from Prospa is that they know they can get an immediate answer and if their application is approved they can have the money in their bank account within 24 hours. Another is its “pain free customer experience” as evidenced by a Net Promoter Score of 77 which compares to the average of the big four banks of -9. And thirdly, they dont have to offer security other than a personal guarantee. Borrowers don’t go to Prospa because its cheap. In fact borrowing from Prospa can be very expensive with annualised rates ranging from 40 per cent to 60 per cent. But the question needs to be asked “expensive compared to what?” If the bank wont lend there is no point in making a comparison to bank interest rates. And if all other options have been exhausted and the need for the money is urgent, accepting “expensive” money from Prospa is entirely a decision for the borrower. It is important that SMEs have this option and if they prioritise speed and convenience over cost that is their prerogative. But at the same time, borrowers are entitled to be able to readily tell how much a loan will cost and whether they can get a better deal elsewhere. On this front, Prospa has some way to go. When quoting its rates, Prospa prefers to use a “factor rate” as it believes the simplest way to describe the cost of a loan is via a payback multiple. Prospa’s prospectus offers an example based on an projected factor rate of 1.24. For an average loan of $26,000 over a term of 12 months this means that the repayments would total $32,240 of which the interest payments would be $6,240. Whilst this does sound like a simple explanation, some people might mistakenly conclude that the annual interest rate is therefore 24 per cent ($6,240/$26,000). This would be correct if the borrower had the use of the full $26,000 for the entire term but in reality the principal is repaid progressively over the term. The only time the borrower gets access to the full amount of the principal is on day one and every day thereafter it reduces but the repayments remain the same. An alternative, more broadly accepted comparative measure of cost is the annual percentage rate or APR. A note in the prospectus discloses Prospa’s historic APRs. At 31 December 2017, its weighted average APR was 41.3 per cent, in the year to June 2017 it was 45.2 per cent and to June 2016 it was 59 per cent. Prospa projects a slight further fall in the 2018 year. It would appear these rates exclude origination fees as well direct debit fees which all add up. An origination (establishment) fee on a $26,000 loan could be $500 which adds 1.9% to the total cost of the loan. 43 per cent of Prospa’s loans are on a daily repayment plan and with a direct debit fee of $5, this will cost $1300 over 12 months adding 5 per cent to the cost of the average loan of $26,000. APRs are a good measure but you need to know what is included or not. Time poor and relatively unsophisticated SMEs usually don’t pay much attention to fees and charges outside of the headline periodic repayment amount but this is where they can get caught out. For example, Prospa applies significant charges and penalties if a borrower cant make a payment including a dishonour fee and a late payment fee which is calculated as a percentage of the outstanding balance for every day that the loan is late. If a borrower wants to repay early, they can be required to pay all the interest for the unexpired period of the loan. This is not a “penalty” because a clause deep in the loan agreement stipulates “any prepayment under this clause does not reduce the amount of fees and does not reduce the interest payment unless the lender agrees”. Meanwhile the website and advertising material states “there are no additional fees for early repayment” and “once you make the final payment your balance will be $0”. All technically correct but fair and transparent? In the prospectus, Prospa notes “changes in loan contracts or other documentation may have a materially adverse effect on the perception of distributors or borrowers of the cost of Prospa’s products relative to other financial products which may have a material adverse effect on Prospa’s business”. One possibility that was identified was the Royal Commission recommending disclosure of broker commissions which could lead to a change to Prospa’s pricing disclosure. Prospa sources about two thirds of its loans through intermediaries such as finance brokers and aggregator networks. Fees paid by Prospa to brokers and introducers, and not disclosed to borrowers, are often around 4 per cent but can be as high as 8 per cent. Payment of undisclosed fees at this level for doing nothing more than making a referral can drive behaviour that is not in the best interest of borrowers. In November 2016, Unfair Contracts Terms law was extended to protect small businesses from unfair terms in standard form contracts. Prospa says it has reviewed and has committed to continuing to review its loan contract as and when required but it stopped short of stating that it is currently compliant with UCT law. 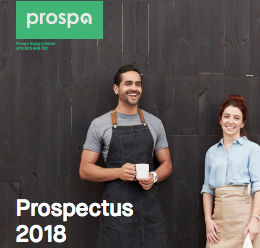 The prospectus is a window into the opportunities and challenges faced not just by Prospa but other fintech lenders as well. As the first to float and as the acknowledged market leader, Propsa needs to lead by example. It is part of a group of other balance sheet fintech lenders that at the end of June are expected to agree on a code of lending practice which will outline best practice principles and provide measures for standardising transparency and disclosure, including use of standard terms, comparative pricing measures and a summary loan agreement page. This is expected to include the use of APRs and other comparative measures. It is to be hoped that this industry led initiative will help SMEs to more easily and accurately work out how much a loan will cost and to compare this with alternative offerings. The adoption of a code of practice will be an important first step but then the work begins in earnest. As we have seen at the Royal Commission, codes are worthless unless properly applied and diligently enforced. ASIC which has come under scrutiny at the Royal Commission for going too easy on the banks, cannot afford to stand by as revelations surface about poor conduct in the largely unregulated non-bank SME lending sector. Fintech lenders have moved beyond their start up phase and are now a genuine alternative source of debt funding for many SMEs. There is no doubt the upside for the leading player in this transformational market is very significant. Only time will tell whether Prospa which in the 2017 statutory accounts recorded revenue of $56m, EBITDA of $3.8m and NPAT of $1.2m is worth its $576m IPO price tag. There are many factors which will drive Prospa’s share price but none are more important than its genuine commitment and adherence to transparent and responsible lending practices. At 40-60% interest rates, is any borrower actually better off after repaying the loan? Or are most in even deeper trouble? I would love to see a greater focus on the community around a business coming together (their clients and suppliers) to help their growth. Clients paying faster (or even pre-paying), suppliers allowing longer payment terms. That would create a much healthier business community, rather than every business battling it out on their own. Hi Alexander, most SMEs could not afford rates at these levels on an ongoing basis but for short terms this finance may be a solution. The point is SMEs are entitled to readily assess the true total cost and to be able to make apples with apples comparisons. At the moment this is very difficult – if not impossible. The community focus is commendable and to an extent this currently exists via the P2P platforms which simply match borrowers with lenders. There are much fewer issues re transparency and responsible lending in this sector. « Will the bank chairmen step up, step down or be sacked?